Beginning Sunday, January 27th, “River of January: Figure Eight,” Kindle edition, is on sale. Purchase “Figure 8” for .99 cents until February 3rd. A former student posted pictures yesterday of a cadet event at West Point. In a formal ceremony he and his classmates were presented with gold class rings in what looked like an annual military tradition. According to the post these rings were made from gold melted down from deceased former cadets, and shavings from the remains of the Twin Towers. A moving and inspiring affair for sure. Parades on Veterans Day, Memorial Day, The Fourth of July, festooned with waving flags, highlight the modern veneration Americans feel for their warriors, past and present. But this honor and respect wasn’t always held for our fighting forces. In fact from the close of World War One in 1918 until the attack on Pearl Harbor in 1941, Americans across the country roundly rejected and criticized anything to do with the armed forces. As I go about the Northwest, speaking on “River of January,” folks are consistently surprised with the contempt the public held for soldiers and sailors in the book’s setting. The central figure in the memoir, Mont Chumbley shared with me before his death that at the time he enlisted in Norfolk Virginia, signs appeared in city parks warning, “dogs and sailors keep off the grass.” And it is that quote that draws stunned reactions from listeners. The killing fields of World War One dragged on for three bloody years until America joined on the side of the Allies. Woodrow Wilson, the sitting President betrayed his earlier campaign promise of, “He kept us out of the war,” quickly changing his mind about Europe. He ultimately asked Congress for a declaration of war in April, 1917 to “Make the World Safe for Democracy.” This idealist Chief Executive sent American boys across the Atlantic to remake the world in the image of America’s republican system. American soldiers, “doughboys,” weren’t in any way ready to deploy, quickly activated and barely trained. Still the recruits and draftees were promptly loaded onto troop ships landing in time to stave off a final German offensive. Gung ho and naïve, US forces made the difference almost at once, charging enemy trenches in blind innocence, with a faith in their youthful invincibility. The exhausted, war-weary combatants, particularly the German “Huns,” soon collapsed, requesting an armistice in November of 1918, ending hostilities. 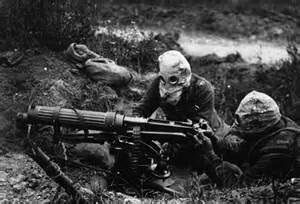 World War One had unleashed unthinkable horrors in tactics and weaponry. Foul sewage-filled trenches, poison gas, machine guns, aerial bombing, torpedo launching u-boats, tanks, barbed wire, and “no man’s land,” sickened the American people. An outraged sense of being duped into war by big business and self-serving politicians became universal. Beleaguered President Wilson attempted to salvage purpose from the unspeakable carnage with his “Fourteen Point” peace plan, including his “League of Nations,” a forerunner to the United Nations. Citizens universally rejected Wilson’s efforts to remake a peaceful world. In fact, Americans rejected any form of internationalism whatsoever. War was pointless, and the nation resolved to never venture abroad again, period. An attitude of isolation gelled and hardened into popular opinion for years to come. Any boy who joined the service was considered a no account scoundrel with no ambition, or self respect. It was in this hostile atmosphere Mont Chumbley bucked popular opinion choosing to join the Navy and ultimately fly airplanes. It came as no surprise that his family vehemently opposed his enlistment plans. The entire clan closed ranks, certain the family name and reputation was at stake, and the boy could not be permitted to sully the rest of them. And that is only a single anecdote of one family in a nation appalled by anything military. All three branches faced draconian budget cuts in the 1920’s, with more slashed during the Great Depression. Military leaders hustled to find ways to justify their shrinking budgets before Congress. Military planners were met with answers such as that concluded by Congressman Gerald Nye. Results of Representative Nye’s study determined the US only entered the World War to enrich munitions manufacturers and bankers. The Navy had already taken an earlier hit when a moratorium was placed on building any new battleships. America didn’t need them anymore, the country would never go to war ever again. And that attitude persisted from 1919 to 1939 until Hitler’s blitzkrieg shattered the peace. But even then the US did not involved itself, even as England stood alone before the Nazi onslaught. Instead Congress passed Neutrality Acts tying the President’s hands to help the English. American entry into that war didn’t occur until the Japanese attack at Pearl Harbor two years later, in December of 1941. The “Long Weekend” starved America’s military for twenty years. That Mont Chumbley managed to join at all, and managed to fly the few aircraft the Navy possessed is nothing less than a miracle. That farm boy from Virginia overcame immense barriers; stiff family opposition, social ridicule, and crossing an immense chasm to become a Navy pilot.